When it comes to dietary choices, I am a huge advocate of no ‘one size fits all’, and exciting advances in DNA technology has helped paved the way to unlock bio individual dietary blueprints. Yes! The power of the plate! Your DNA is your ‘hardware’, and all of these epigenetic factors is the ‘software’, that can literally decide how your operating system is going to run. Would you like to know more about your unique DNA code? For more information schedule a complimentary 20 minute call. No matter what your nutrition program of choice, unprocessed plant based foods high in fiber provide a nutrient rich antioxidant longevity boost. 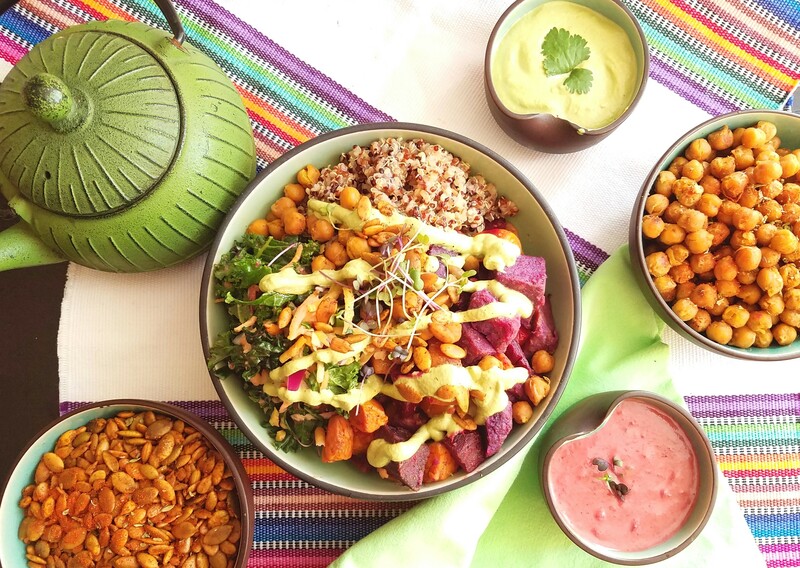 Trending in the foodie world right now are large bowls piled high with an assortment of choices such as grain, salad or protein, and generally drizzled with a sauce. 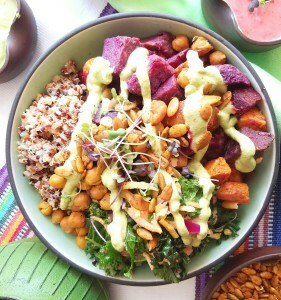 Vibrant, bountiful bowl, overflowing with vitality, and most appealing, I decided to coin my own Taste of Healing phrase for this dish, behold the “Bountiful Bowl”! With no hard and fast rules as to what ingredients comprise a Bountiful Bowl, the key a composed arrangement rather than tossed together. Choose a wide, shallow bowl, and place the salad, roasted root vegetables and quinoa in thirds in the bowl. Drizzle with the cilantro creme, and top with the pumpkin seeds and chickpeas. This was the yummiest thing I’ve eaten in a while! Carol prepared this for the Red Dress Luncheon at Integra Wellness today, sponsored by the Heart2Heart Foundation and CCA. Lot of women in that room that are dynamos in the community, advocating for the greater good of all. This group definitely deserved this taste of healing! Carol taught us that the food that truly nourishes and sustains our bodies can, and should , also be delicious! Thank you Carol, your message is powerful and your food is wonderful! !